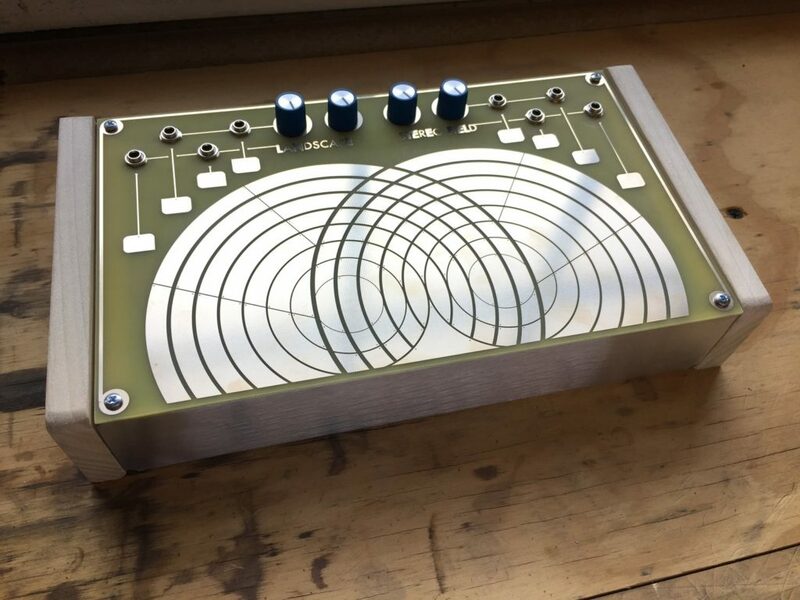 STEREO FIELD is a sound box / controller centered around touch plates, marked with concentric overlapping circles that represent the interconnection of two analog stereo circuits. It’s a sound generator: you can make some (raw sounding) analog, atonal sounds by patching its circuitry to an output. It’s also a sound processor: use incoming signal to combine (and distort) incoming sounds. And, it’s a controller: connect the output and use it as control signal instead of listening directly. But its architecture makes it simple to do any of that with stereo or quad sound input and output. Those touch plates become timbral controls, but spatial ones, too. You can process inputs and outputs simultaneously, “weave” together sounds and spatial signals, and “inter-patch” beats and shifting colors. And those touchplates are sensitive such that you can use touch, or move your hands near the plates (Theremin style), or even breathe on them. All of this is in an aluminum and maple enclosure with “gold immersion” touch plate. There are 4x minijack inputs and 4x minijack outputs, plus 1/4″ jacks, and each physical signal has a connection to its own touch plate. It’s US$380, available now for preorder. Due to ship in April. The hardware is a product of Brooklyn’s Landscape Tapes label, who have also done a beautiful tape cassette machine called the HC-TT.